Prepare your stand mixer with the dough hook attachment. In a large bowl, whisk together your all-purpose flour, bread flour, baking soda and salt. Set aside. In a small pot, heat the whole milk over med high heat. If using a cooking thermometer, heat until it reads between 105°-110°. If you don't have a thermometer on hand, just heat until you see small bubbles starting to appear on the surface. Then remove from heat. Pour the heated whole milk, buttermilk, yeast and sugar, into the bowl attached to the stand mixer. Whisk and allow the mixture to sit for 5mins. After, drop in you dry ingredients. Mix on low for 4mins, until everything is well incorporated. Then, up the speed to medium, for 2mins. There should be a semi-formed bowl developing on hook. The dough should appear smooth and tacky to touch. Remove the excess dough from the hook and cover the bowl with plastic wrap. Then, set aside for 1 hour in a draft free area. In a large pot, pour in the oil, until it's 3 inches deep. Over medium heat, heat the oil for about 15-20mins. You can check the oil by flicking water drops in, if it sizzle, it's ready. Prepare a plate covered with paper towels or place a cooling rack over top of papers towels. Set aside. Prepare the work surface by generously dusting with flour. Pour out the dough onto the surface and lightly cover with flour. Work the dough with your hands. Press the dough flat, fold in 1/2 and roll with palms into a ball. Using a floured rolling pin, roll out until the dough is 1/2 inch thick. Using a sharp knife or pizza roller, cut the dough 2"x2" squares. Let the pieces rest for 5mins. The surface should feel taught to the touch. Carefully drop the dough into the prepared oil. Be sure not to overcrowd, only 3-4 pieces per batch. Cook until golden-brown on each side. This should only take about 1 minute on each side. Use slotted spoon to remove the cooked beignets. Place on the the plate/cooling rack to cool. Prepare with desired topping. Enjoy! In a large bowl using a hand mixer or in a stand mixer using the paddle attachment, dropping all of the ingredients and mix until well incorporated. To create the opening, use a knife to pierce a small pocket into the beignet. Then, using a piping bag (or a Ziploc bag) pipe in the Nutella cream. In a medium bowl, drop in the brown sugar and rum. Heat for 30secs in the microwave, until the sugar is dissolved. Next, put the confectioners' sugar and cream into the bowl and mix well, using a rubber spatula (a spoon will suffice). Dip the prepared beignets in the glaze, set aside to harden for 5-10mins. #3 CINNAMON SUGAR AKA. "SNICKERDOODLE"
In a large bowl whisk together the sugar and cinnamon. Drop the beignet into the bowl and shake well, until fully coated. 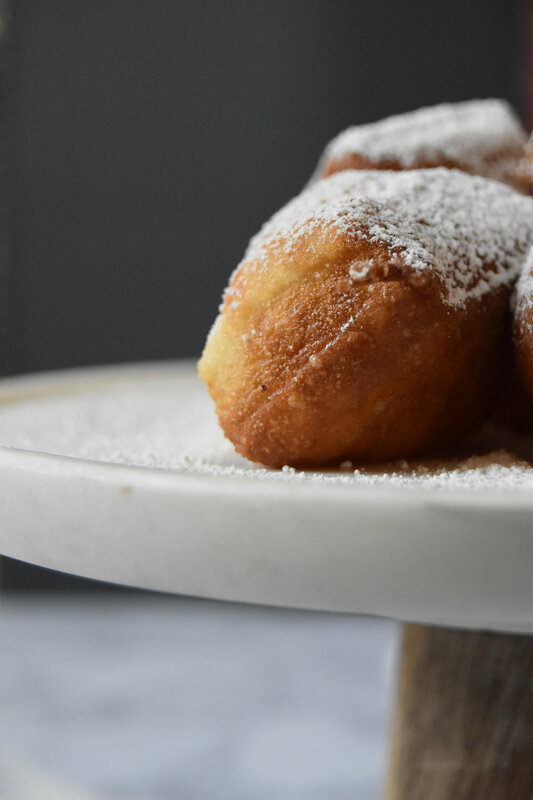 Using a sifter (or slotted spoon) dust a generous amount of sugar atop a plate full of beignets.